The hullabaloo of the holidays has finally settled and many Canadians are now focusing on their New Year's resolutions. For those of you who resolve to quit smoking, there's good news. Not only will you save money on the cigarettes you no longer buy, but you'll also enjoy savings on your life insurance premiums because life insurers offer lower rates to non-smokers. As a smoker, you may have thought getting life insurance was too expensive. While it's no secret that life insurers provide coverage to smokers at a higher premium than non-smokers, it's likely more affordable than you think. However, there is certainly no denying non-smokers get a premium break on their life insurance rates. Lowest quote offered online at Kanetix.ca in December, 2016. 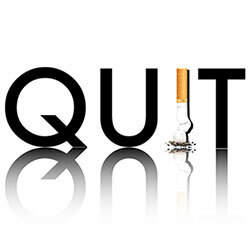 How long after quitting smoking are you considered a non-smoker? For ex-smokers, who resolved to quit last year, most life insurance companies consider you a non-smoker once you've been smoke-free for 1 full year. Way to go, because that means, you should now be able to get non-smoker rates! So if you already have life insurance coverage, you'll want to speak with your broker or insurance company so they can update your premiums to reflect your new non-smoking status. And, if you were too afraid to get coverage as a smoker, now is an ideal time to get the coverage you need. At Kanetix.ca, you can compare life insurance premiums for Term 10, Term 20, Term 30 or Term to 100 coverage for policies with face values ranging from $50,000 up to $2 million. Here's to your health and a smoke-free year!